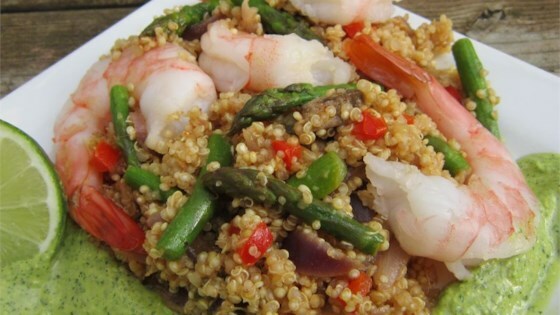 "This delicious shrimp, quinoa, and vegetable recipe can be eaten hot as a main dish or cold as a salad." In a large pot, bring the water to a boil, and stir in the quinoa. Cover, reduce heat to low, and simmer 15 minutes. Remove from heat, and set aside 10 minutes, or until all liquid has been absorbed. Heat 2 tablespoons olive oil in a skillet over medium heat, and saute the onion and green bell pepper until tender. Mix in the mushrooms, asparagus, raisins, and ginger, and continue cooking until asparagus is tender. Season with salt and pepper. Mix in the shrimp, and cook 5 minutes, or until opaque. In a large bowl, mix the quinoa with the lime juice and remaining 2 tablespoons olive oil. Toss with the skillet mixture and parsley to serve. Excellent quinoa recipe. I added sliced grape tomatoes, too. I left out the quinoa & lime, used orzo and chicken stock instead. Very good; made twice in one week, once with shrimp, once with tilapia. Delicious both times!